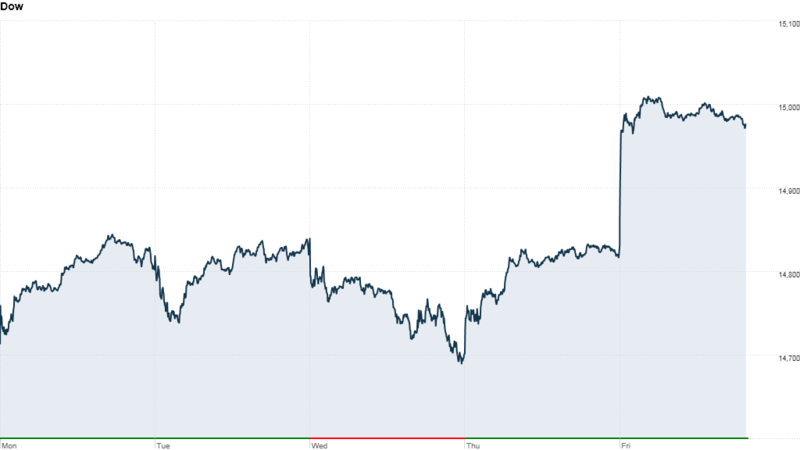 Investors cheered the latest report on the U.S. job market Friday, pushing the Dow Jones industrial average briefly above 15,000 for the first time. The Dow rose 0.9% to end the day at 14,972. The S&P 500 gained 1%, rising above 1,600 for the first time. The Nasdaq gained 1.1% to end at the highest level since November 2000. "The round numbers are psychologically important, especially for those cautious investors sitting with their cash on the sidelines," said Jack Ablin, chief investment officer at BMO Private Bank. Stocks could continue moving higher as individual investors who missed the rally of the past few years have been drawn back in as stocks hit new highs. "I'll call it a momentum effect," said Ablin. The rally caps a solid week: The Dow rose 1.8%; the S&P gained 2% and the Nasdaq added 3%. April was another strong month, with the S&P 500 advancing for the sixth consecutive month. Friday's gains came on the back of positive jobs data. The U.S. economy added 165,000 jobs in April, according to the government's latest report. The unemployment rate dipped to 7.5% from the prior month's rate of 7.6%. Both numbers were better than expected, easing concerns about a summer slowdown in the economy. But the unemployment rate is still well above the level at which the Federal Reserve has said it will ease its stimulus program. "Good numbers all around, but still shy of where they need to be to drive the economy forward or get the Fed to consider lowering its 'buying' number in the coming months," said Kevin Giddis, head of fixed-income at Raymond James. The jobs data, which came after a string of disappointing reports this week, overshadowed other less encouraging economic data released Friday. Factory orders fell 0.4% in March, according to the Census Bureau. The report was worse than expected and came after a 1.9% drop in February. The Institute for Supply Management said its index of activity in the services sector fell in April, but remained above the level indicating growth. What's moving: LinkedIn (LNKD) shares plunged after the professional-networking site offered weak second-quarter guidance. 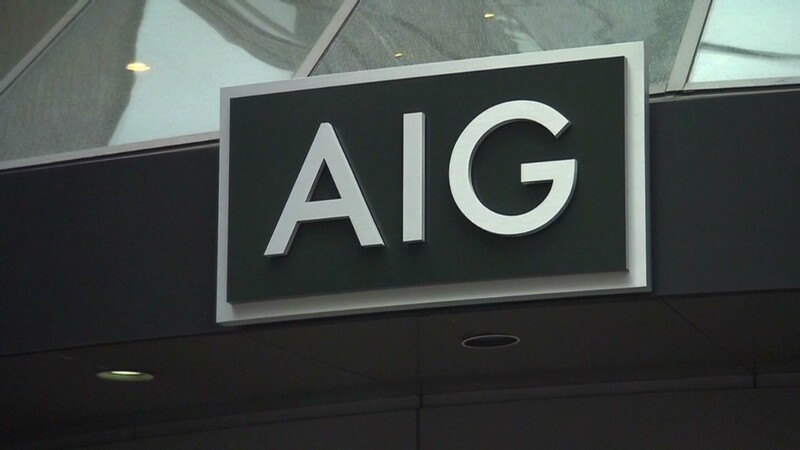 AIG (AIG) shares rose after the insurer reported earnings that beat expectations Thursday. Shares of 3D Systems (DDD) rose after office supplies retailer Staples (SPLS) announced plans to sell the company's 3-D printer. Yahoo (YHOO) shares rose to a five-year high on renewed optimism over the Internet pioneer's turnaround plan. Warren Buffett's investment firm Berkshire Hathaway (BRKA) is scheduled to release quarterly earnings after the market close. European markets rose despite a grim economic forecast from the European Union. The EU trimmed its forecast for the eurozone gross domestic product, to a decline of 0.4% in 2013. The forecast for 2014 was also trimmed, to a gain of 1.2%. Asian markets ended higher. The Shanghai Composite added 1.4% and the Hang Seng increased 0.1%. Japan's Nikkei was closed for a holiday.